Kyah Watson plays defense in the Raiders' first round game against Harrisburg Thursday. RAPID CITY, S.D. - The Mitchell Lady Kernels provided a big surprise to open the South Dakota Girls Class AA Basketball State Tournament. Mitchell beat top seeded Sioux Falls O'Gorman 63-54. Mitchell outscored the Knights 20-14 in the second quarter and O'Gorman just couldn't keep up down the stretch. Mitchell had three players in double figures. Mackenzie Miller led the Kernels with 19 points. Tess Limberg added 16 points and Payton Morgan chipped in 13 points. Isabelle Moore led O'Gorman with 13 points. 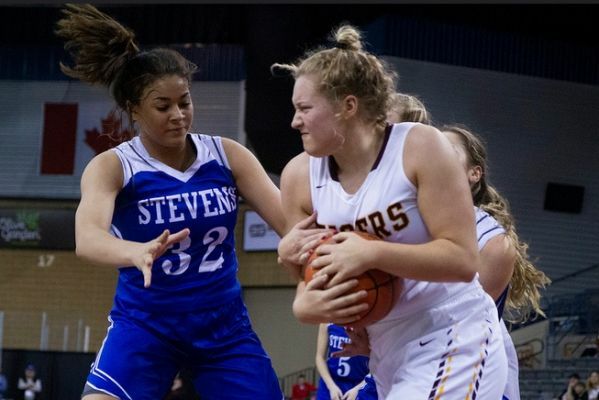 In other games, Rapid City Stevens dropped their opening game to Harrisburg as the Tigers won 55-45. Harrisburg opened the game with a 17-10 run and never relinquished the lead. Kyah Watson led the Raiders with 12 points. Elswhere, Sioux Falls Lincoln edged out Sioux Falls Washington 36-31 and Brandon Valley rolled over Brookings 68-37. Mitchell will play Brandon Valley in one semifinal game with Harrisburg playing Lincoln in the other. Stevens will play Washington in consolation.